My holiday reading is usually non-work related, but I have made one exception this summer, finishing Richard Murphy's 'The Courageous State. For those not familiar with Richard, he is a chartered accountant and political economist who advises the Tax Justice Network amongst others. His Tax Research UK blog, now ranked the number 1 economics blog in the UK, has put the Tax Gap high on the political agenda. A day rarely goes by without me tweeting something from it. He has a prodigious output of quality analysis. This book does three things. First, it says that neoliberalism has given us feeble politicians who think anything they do will be worse than the market outcome, so they do little or nothing. They fail us as a result. Second, it argues that this is wrong and a whole raft of new economic thinking from Richard shows why. And third, it contains a whole range of economic policy proposals that courageous politicians could adopt to get us out of the neoliberal mess we're in. I also enjoyed his first book (with others) on tax havens. However, it wasn't the easiest read. 'The Courageous State' is written much more with the general reader in mind. Here are two reviews from good writers that spell out why. I am reading this book on my iPad. A bit heavier and more cumbersome than the Kindle, but great for highlighting and bookmarking sections you want to keep. Needless to say there are acres of highlights in my copy! And my leisure reading? The second in Robert Low's Kingdom series covers the execution of Wallace and the crowning of Robert the Bruce. Bob lives in Largs and is a former journalist, perhaps better known for his Viking books. His treatment of the wars of independence is bit grittier than, say Nigel Tranter, but is well written. Lastly, 'Eagle', the first of Jack Hight's Saladin Trilogy. I enjoyed his first book on the siege of Constantinople. He writes really good historical fiction, just as I like it. There are a few more books in the reading pile, just in case the weather keeps me off the golf course! I was in Cardiff last weekend at our Labour Link Forum. My first union post was in the city and it has certainly changed a lot, particularly the area around the Welsh Assembly. On Saturday I contributed to a workshop sharing experiences of devolution. Something we do too little of with Welsh colleagues and in this session, delegates from London. Two Welsh Assembly Members outlined their experience of devolution, one of whom was formerly an MP so could offer some comparisons. Their experience was very similar to ours. They stressed the immediacy of the political process under devolution. Working much closer with the public and trade unions. Of course we both recognised that this also has much to do with the size of our countries compared to England. Something English colleagues may wish to consider if they revisit regional government. They also highlighted the disconnect between the experience of devolved governments and Westminster. Devolved governments have delivered in very different ways to Westminster, yet there seems to be a nervousness at UK level to showcase the achievements. Labour in Wales have delivered some impressive initiatives, putting clear red water between them and Westminster. This reflects our own experience of devolution when there was often a reluctance to highlight the very different solutions Labour developed in Scotland. They also indicated a close interest in our constitutional debate and the wider implications for the whole of the UK. This is something that has been given limited attention so far and it was interesting to see Welsh FM Carwyn Jones today calling for a constitutional convention for the UK. He has also proposed a reformed House of Lords with equal representation from the four nations, similar to the model used by the US Senate. He also spoke at the Cardiff conference in a speech that impressed Scottish delegates in particular. "The rational solution is surely to turn the new House of Lords into a Senate elected largely on a regional basis to reflect the new constitutional reality. I've been punting this idea around for some time and I've yet to hear a sensible argument why it shouldn't work. If a Senate works in America, Australia and a host of countries, why not here?" The problem is that England needs to be persuaded and probably to go down the road of regional government, or at least regional representation. That didn't have much traction when it was last tried in the NE referendum, although the removal of powers from local government muddied the waters there. Either way there appears to be some merging of our constitutional debate and House of Lords reform. In Part One of this blog I covered the fiscal implications of the constitutional options currently on offer, either through independence or extended devolution. In Part Two, I will set out some of the possible solutions I discussed at the recent Red Paper event in Glasgow. I should emphasise that all this is consistent with our general Red Paper approach to this issue. We are not a think tank who has disappeared into a dark room to produce a proposal. We want to engage those sympathetic to our aims in Scotland, to develop a left alternative that focuses less on the mechanics of devolution and more on what we can do with additional powers. If we look at other European countries that devolve fiscal powers, taxes on income are the most popular, followed by property and then taxes on consumption. The Scotland Act 2012 already gives Scotland significant powers over income tax and many property taxes are already devolved. Consumption taxes, primarily VAT, are difficult to devolve because EU rules generally don't allow variations within nation states. Whatever taxes are devolved there has to be some mechanism through grants or borrowing to address volatility in tax revenues. 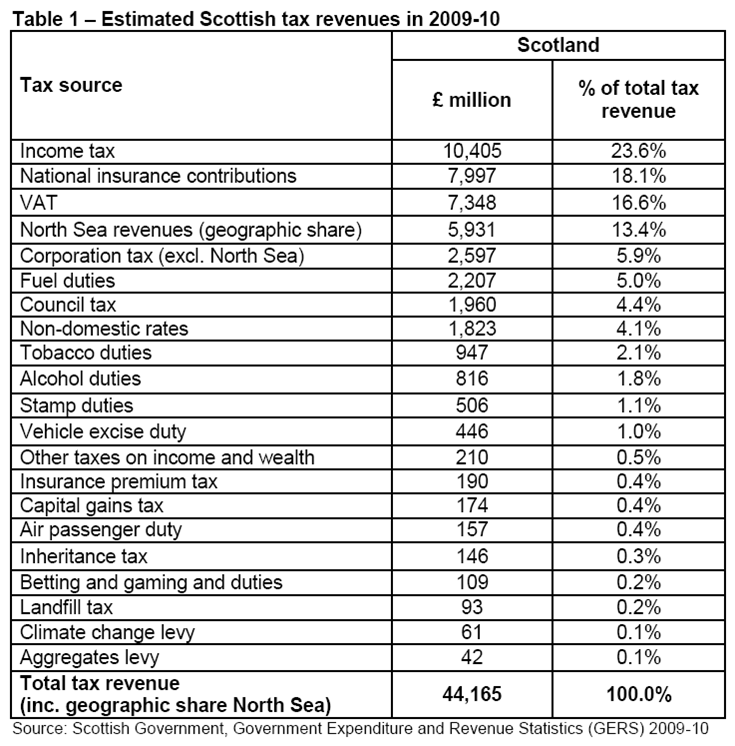 The table below sets out the current estimate of income raised by each tax in Scotland. It can be seen that detailed discussion of many taxes is of only academic interest because the revenue raised in Scotland is small. 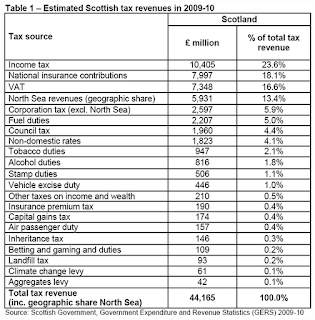 At present revenue from devolved taxes in Scotland is one of the lowest in Europe at 13.8%, just over £4bn. After the Scotland Act 2012 is implemented that will rise to 30.8%, just over £9bn. This will put Scotland in the same league as Germany and Sweden, with one of the most devolved tax revenues in Europe. However, because a Scottish Government can't vary the rate in each band, any increase in income tax is not as progressive as I would wish. This is illustrated in the table below. Taxation is not the only power we should consider. As described in Part One, the Scotland Act 2012 gives the Scottish Government new borrowing powers and there is a consultation on bond issuance. However, again these are very limited, both in method and amount, with the Treasury orthodoxy insisting on central government’s right to control overall state finances. This is a crucial issue for Scotland and in my view it is essential that Scotland gets wider borrowing powers. The only restriction should be prudential i.e. can Scotland finance the cost of borrowing from revenue. This power already exists for local government therefore it seems absurd that devolved administrations should not be able to replicate that authority. With such flexibility we could finally get rid of the huge cost of PPP/PFI schemes by giving prudential borrowing powers to health boards, NDPBs and public corporations, including Scottish Water. This is because Scotland operates in a global market dominated by the Washington Consensus. On tax this means promoting falling income tax rates, low corporation tax, higher consumption taxes, low taxes on wealth, tax simplification (including flat tax) and creating tax competition with a race to the bottom for the rich. In the UK over the last 30 years this ideology has resulted in UK income tax rates falling from 60% to 45%, and Corporation Tax from 52% to 22%. VAT has increased from 12.5% to 20%, tax havens banned to tax havens encouraged with 5.5% tax rate and Inheritance Tax almost gone. We now have the lowest number of HMRC staff ever, creating a tax gap of some £130bn. For more on this I would strongly recommend the Tax Justice Network.  Sustainable development including green taxation.  Contribute to global approach to corruption, tax evasion, information, capital controls. Race to the top in addressing inequality and poverty. · Devolve all property based taxes. They already largely will be after the Scotland Act 2012 is implemented. I am agnostic on adding Inheritance Tax given the modest amount it raises, but logically this should be included. · Income tax fully devolved. Partial devolution doesn’t make a lot of sense. This could include National Insurance as the link with contributory benefits is becoming increasingly weak and it may in any case be merged if the Chancellor gets his way. · Business taxes should remain at UK level for the reasons outlined above and in Part One. Tax competition is wrong in principle and in any case will be constrained by tightening EU rules in this field. · Consumption taxes (primarily VAT) again largely at UK as EU rules don’t allow variable rates in the same state. There is a stronger policy element to fuel duty, tobacco and alcohol taxes, but given the integrated nature of the UK it is hard to see how these could be set differently in Scotland. Unless the aim is to promote the sales of white vans! · Full prudential borrowing powers including bond issuance. Will any of this significantly improve the governance of Scotland? Probably not a lot, as I remain sceptical that the political will exists to use these powers to achieve the strategic aims I propose. But they will at least force the Scottish Parliament to consider how they might be used to create a better, more equal society. A few meetings over recent weeks on the draft UK Energy Bill. This Bill introduces Energy Market Reforms (EMR) together with some reform of Ofgem and nuclear inspection. The draft Bill has been published and the Bill will be introduced in Parliament later this year. Royal Assent is planned for late 2013, with reforms implemented by secondary legislation in 2014. The energy market reforms will introduce a complex mix of mechanisms to underpin the so called energy market. These are needed because around a fifth of current generation capacity will be decommissioned in the next decade. £110bn of new investment is needed, more than double the current rate of spending and existing systems simply won't deliver the mix of capacity that is required. The different mechanisms aim to provide long term price certainty for low carbon generation investment (Contracts for Difference), together with capacity payments to ensure security of supply (Capacity Market). The carbon tax and emission standards will phase out high carbon power generation. These are complex mechanisms and it is unclear exactly how they will work until the secondary legislation stage. It will certainly increase energy prices in the short term, with at least the hope, that they will be lower in the longer term. For Scotland the EMR introduces a complex mix of devolved and reserved powers. The Scottish Government's prime concern will be to ensure that the mechanisms do not disadvantage the renewables industry that they put so much emphasis on. Emission standards and the renewable obligation, key to the system, are devolved powers. Early indications are that renewables may not do as well as nuclear, given the need for long term guarantees. Coal operators looking to CCS are also sceptical. Gas looks like being a gainer, not least because they are exempted from the emissions performance standard until 2045. Overall, uncertainty running up to 2014 is likely to impact on investment, despite efforts to create a smooth transition. We also need to judge the impact of the TRANSMIT review on transmission charges, always a key Scottish issue. UNISON has long argued for a planned energy policy. There is a rich irony that it is the Tory market fetishists that are introducing something very close to a planned policy. They will argue that the planned element is short term, but in reality the regulatory elements are likely to continue for many years. The mechanisms focus almost entirely on the supply side and the consumer barely gets a mention. Given they will pick up the cost, there is a strong case for greater transparency and consumer protection. All of these systems will be complex and expensive. If we wanted to get really serious about protecting the consumer, we would bring the industry back into public ownership. We also need to keep an eye on developments in the European regulatory system. If, as is likely, they adopt a different system - we could end up with supplier incentives to import French nuclear or German coal powered generation into the UK. Finally, what does all this mean for the independence debate? It appears that this is another area where the SNP favour a UK wide solution. Hardly surprising as it socialises the cost of renewables across the UK. It is less clear if the rest of the UK will be as enthusiastic to subsidise generation from another country!